To answer this question, you first need to know what sugar gliders are. Sugar gliders are marsupials - which means they have a pouch like a kangaroo for their joeys. Many people get them confused with flying squirrels, but squirrels are actually rodents. Look at the images below to compare a sugar glider (on the left with a joey on his back) to a flying squirrel (on the right). Sugar gliders are native to the forests of Australia, New Guinea, Tasmania and the Solomon Islands. 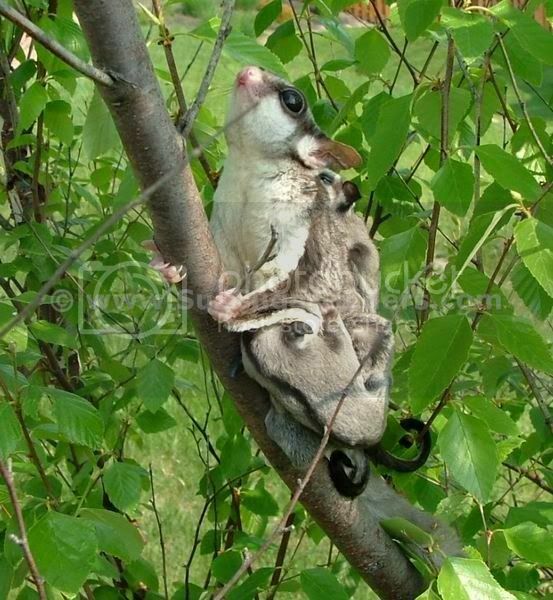 In the wild, sugar gliders live in the tree tops, making them an arboreal species. Sugar gliders are nocturnal, which is why they have large, bulbous eyes and large ears. A sugar glider's hearing is very sensitive. Sugar gliders live in colonies of 8-12 gliders in the wild with one Alpha male, several breeding females and their joeys. They identify members of their colony by scent. Males have prominent scent glands on their heads (the bald spot) and on their chest (also a bald spot). They rub these glands against the members of their colony to mark them. Sugar gliders are very territorial. If a glider from another colony enters a male's territory, he will try to chase it off. Sometimes there are fights for dominance which can result in death. When male joeys become sexually mature, they are chased away from the colony to go develop their own colony and territory. Sugar gliders are marsupials and are most closely related to possums. Many people refer to them as flying squirrels, but they are not, in fact, squirrels, although they do most closely resemble a flying squirrel. Sugar gliders are native to the forests of Australia, New Guinea and the Solomon Islands. Sugar gliders are naturally social animals and need to have a lot of contact with their owner in order to be socially fulfilled. Sugar gliders are nocturnal (awake at night), so it is better to have at least 2 sugar gliders so that they can keep each other company at night while you are asleep and they are awake. Although they are nocturnal, there is still plenty of time to spend with your glider during the day. 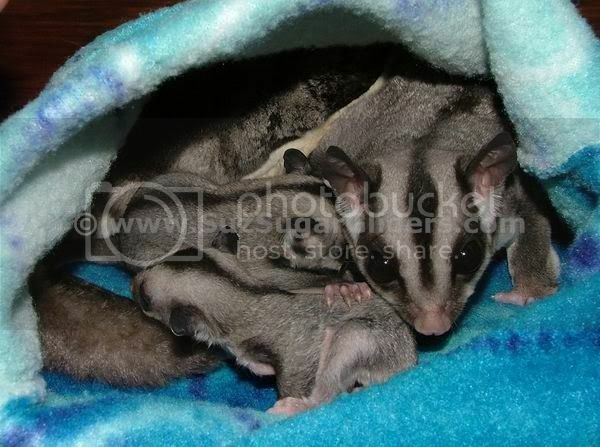 Because they are marsupials, they like to be snuggled up in a pouch during the daytime while they sleep. It is very simple to carry your glider with you almost anywhere you go. I oft-times bring mine to work with me. They are so small and quiet during the daytime, that most people will not even be aware that you have them with you. They are almost always willing to wake up for a bit of attention from you during the daytime. 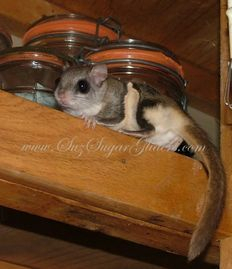 If you are seriously considering adopting a sugar glider as your new companion, please do a LOT of research in advance. Please read through the rest of the information on this site. There is a lot of good information available on the internet and in books; however, many of the books about sugar gliders are very outdated - the best information can be found at the sources listed below. All material, including photographs, protected by copyright © Suz' Sugar Gliders. Any material on this site may not be copied without express permission.